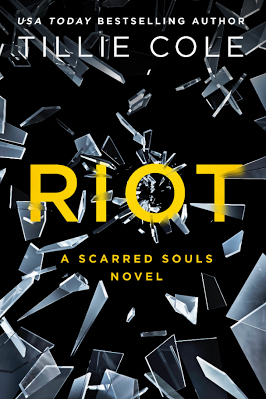 From USA Today bestselling author Tillie Cole comes RIOT (St. Martin’s Griffin; Trade Paperback; March 7, 2017; $15.99; 978-1-250-08628-0), the anticipated gritty and raw final installment of the Scarred Souls series. Cole proves that love can truly overcome everything in her latest compelling and dark romance. Stolen by the Arziani Georgian crime mob as a child, 152 was raised and conditioned to be a Mona—the most subservient of the Arziani Blood Pit slaves. 152 has been living in a drug-induced fog for most of her life, but now she can finally think clearly when she is gifted to one of the death match fighters. 152 will have to fight for what she wants and ultimately make an impossible choice. Brutal. Intense. Passionate. The World of the Scarred Souls. They call me 901. I am a monster, a killer, a champion. In the blood pit I am a god. I have no name, no family, and no identity. When master says fight, I fight…until I am the only one left standing. I have one goal, to fight so well that I am freed. I don’t need friends, I don’t need women. They are weaknesses. I am strong. Until I see her. She is gorgeous and kind and off-limits to me. She was stolen as a child to be the worst type of slave and now master wants her. What he wants, he gets. With a smile, she melts my brutal heart. I have never wanted anything more. I need to make a choice. Freedom or Love. I cannot choose wrong. ABOUT THE AUTHOR: After graduating from Newcastle University, Tillie followed her Professional Rugby player husband around the world for a decade, becoming a teacher in between and thoroughly enjoyed teaching High School students Social Studies for seven years. Tillie has now settled in Calgary, Canada, where she is finally able to sit down and write, throwing herself into fantasy worlds and the fabulous minds of her characters. She writes Contemporary Romance, Dark Romance, Young Adult and New Adult novels and happily shares her love of alpha-male leading men and strong female characters with her readers. This is the first in this series for me.... even though Book 4..